Black Beauty / Cassettes was written by Anna Sewell. Black Beauty / Cassettes was published by Books in Motion. 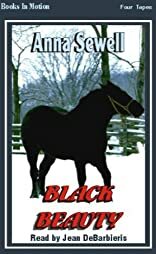 Subjects of Black Beauty / Cassettes include Action & Adventure - General, Animals - Horses, Audio Adult: Books On Tape, Children's Audio - 9-12, Classics, and Juvenile Fiction.